Copyright © Weinrich Minerals, Inc. 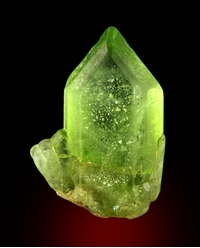 Copyright © Weinrich Minerals, Inc. - This image is copyrighted. Unauthorized reproduction prohibited. 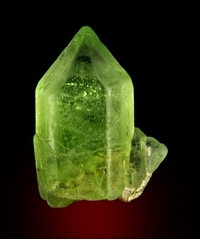 A superb sharp near transparent green single terminated forsterite crystal measuring 2.1 x 1.4 x 0.8 cm in size overall. Complete all around 360 degrees and damage-free. Ex Lloyd Tate collection.